Running and I have a love/hate relationship. I love it because it is a cheap and easy way to exercise. And I love getting out early in the morning and seeing the sun rise while I run. It makes me feel good emotionally the rest of the day. I hate running, though, because of what it does to my body. I just keep beating my body up from my knees to my back to my ankles. And I hate what it does to my mental strength when I’m struggling on a run. It’s a never-ending battle. Every day the alarm goes off at 6am. About 3 days each week, I avoid the snooze button and get up. I rise easily, especially if I’ve gotten into a good routine. I get dressed, lace up my shoes and get my iPhone attached to my arm. Then out the door I go. 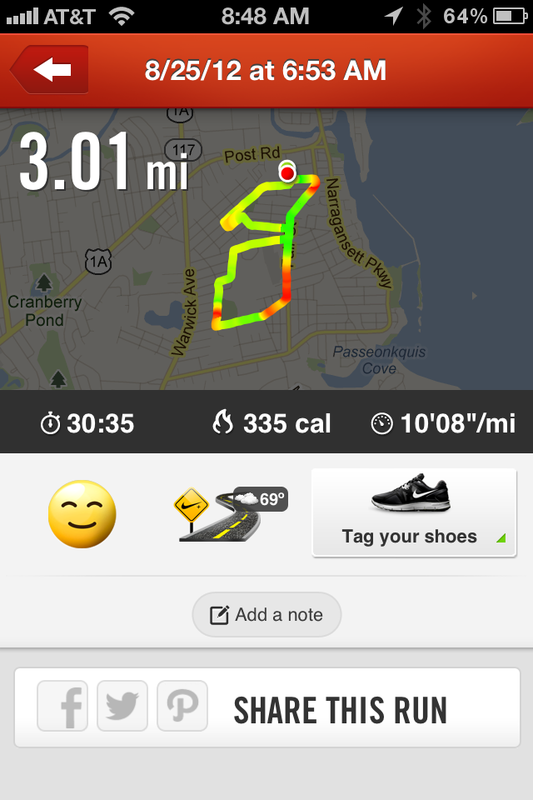 I use the Nike+ app to track my runs. In the past I have always set up the app to run for a specific distance. I guess it was part of my training – knowing what distances I needed to keep running to stay on pace to be able to finish each race I was working towards. But the distance thing was getting old. It was dragging me down. I’m not sure why, but I wasn’t enjoying my runs, and felt it was just something I HAD to do, not something I WANTED to do. So this past Saturday, I laced up my shoes and headed out the door as usual. But instead of setting the distance I wanted to run on my Nike+ app, I set it to “Basic Run.” I didn’t have any distance in mind – I was just going to run until I was done. I even set off on a new course. My usual few routes were getting too “routine” for me. I knew my mile markers on each, and my brain would struggle in the difficult parts each time. So I went a completely new way and actually even felt a little lost at times, which was exhilarating. I ran until I couldn’t run anymore. Then I walked a bit, then ran some more… When I finally made it home, I realized I had run 3 miles! My longest run in several weeks. And I felt good. I felt invigorated. It was everything I had enjoyed feeling before. I was in love with running again. This Saturday, my mom and sister and I will be running in the Charlottesville Four Miler. It’s been a tradition for the past 4 years, and it’s for a cause that is very close to our hearts. Unfortunately it will most likely be the last time we participate in the race. With my sister and her family potentially leaving Charlottesville next summer, it won’t be as easy for us to make a weekend of it anymore. And as we’ve all gotten older, it has become harder to run it. This year we’ll be lucky if we can run the whole thing. We certainly won’t be breaking any personal records, but we’re ok with that. We’ve vowed to enjoy ourselves, to take in the wonderful feeling of the morning out among the horse farms of central Virginia and 3,500 other runners and walkers and just relish in it. It’s an amazing event for sure! I honestly don’t know if I’ll keep running after this weekend. I’m sure I’ll get the itch and desire for an easy way to burn some extra calories. But I’m also looking for alternative ways to exercise and push myself that won’t beat my body up as much. This week, though, I’m ready to run! Thank you for any monetary or inspirational support! 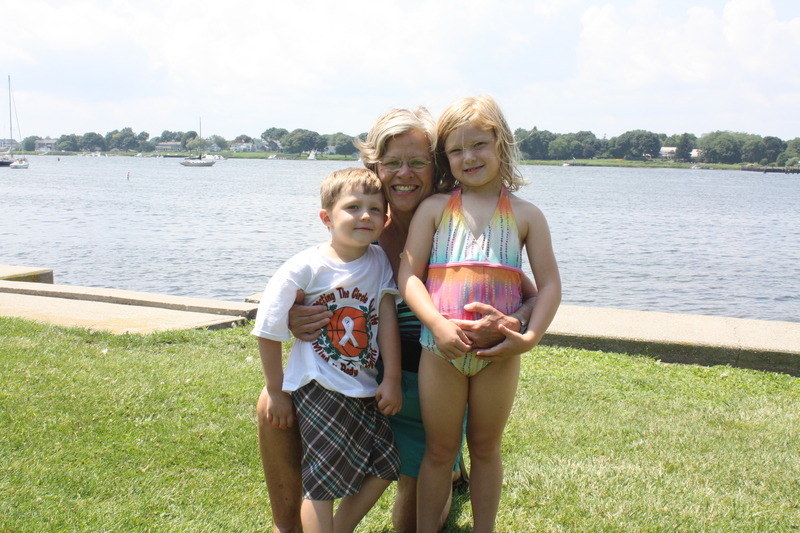 Last week, the kids and I took a last-minute trip down to Maryland to visit family and friends. I realized it was the only free week we had left before school started and therefore our last chance to make a visit before much later in the fall. We left Jeremy behind and drove the 8 hours to my mom’s house. The kids were great on the drive down, and I was so relieved. I stayed awake and, except for one moment of frustration in New Jersey, kept my cool. My sister and adorable nephew happened to be visiting my mom at the same time, so we got in some extra special family time and were even able to celebrate an early birthday for my mom. We also got a little playdate in with my oldest and dearest friend, Annie. 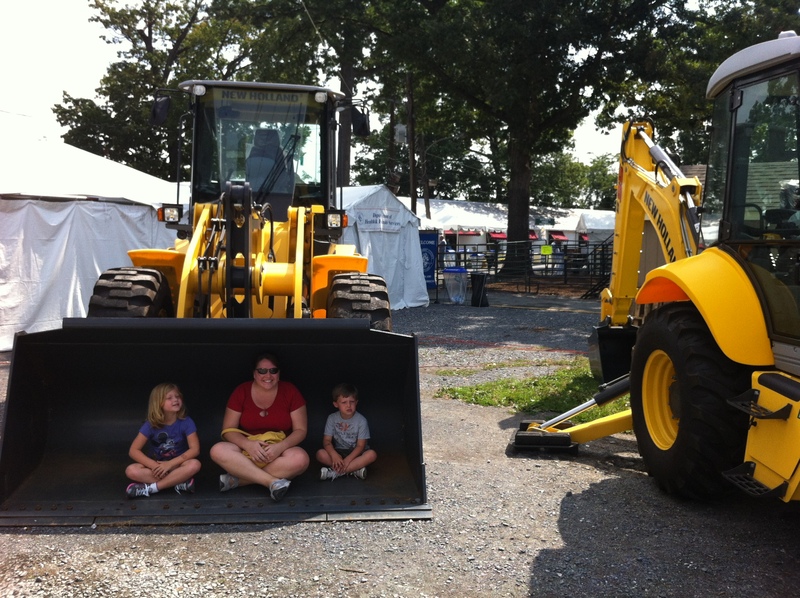 Then we traveled south to hang out with Aunt Kristin at the Montgomery County Agricultural Fair. What a hit! It was unexpectedly hot, and there were definitely some stinky barns, but the kids, myself and Kristin all had a blast. Then off to Clarksville to visit our dear friends, the Niles. Between a bouncy in the basement, singing video games, tacos, and bedtime stories together, the kids were beyond thrilled. Even better is that I got some one-on-one time with my BFF! (Are you keeping up?) The next morning, it was time for even more visiting. A couple of hours with Mason’s BFF, then a quick stop at Cooper’s old school where all the kids were surprised and over the moon to see him (his teacher and I had planned the surprise.) Finally, we started heading north again to Towson to stay our last night with Nana and Papa. We even got a visit from another of my favorite friends, Shana, and her two kids. (Can you tell we were packing it in?) After an amazing week, we were all tired and ready to head back home to Rhode Island. Unfortunately the drive north was not as easy as the drive south. I lost my cool, the kids got bored, and it took 9 hours! Luckily I have some great pictures from the week to remind us of all the great memories we made. 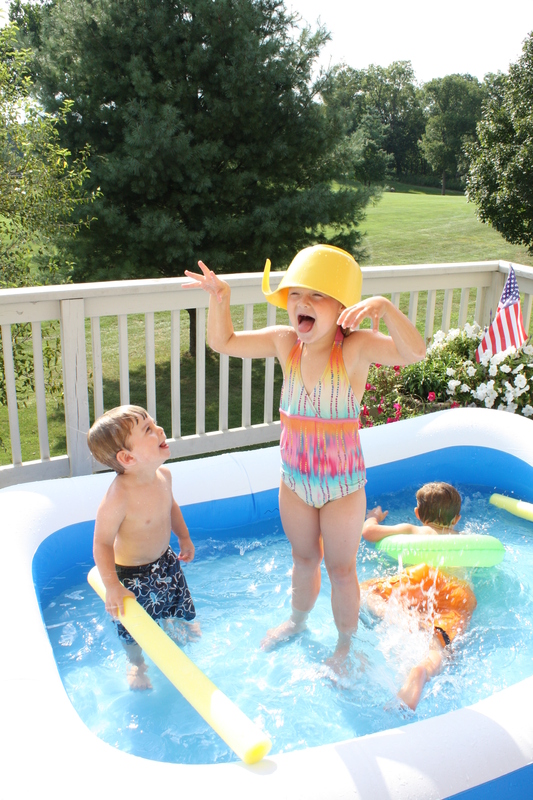 Lots of fun out on Meema’s deck. This picture embodies all the cousins. Mason acting silly. Hayes admiring her always. And Cooper going crazy in another corner. The Montgomery County Fair was awesome! Honestly, I would make the trek down there to go again… and bring Jeremy. He missed so much! 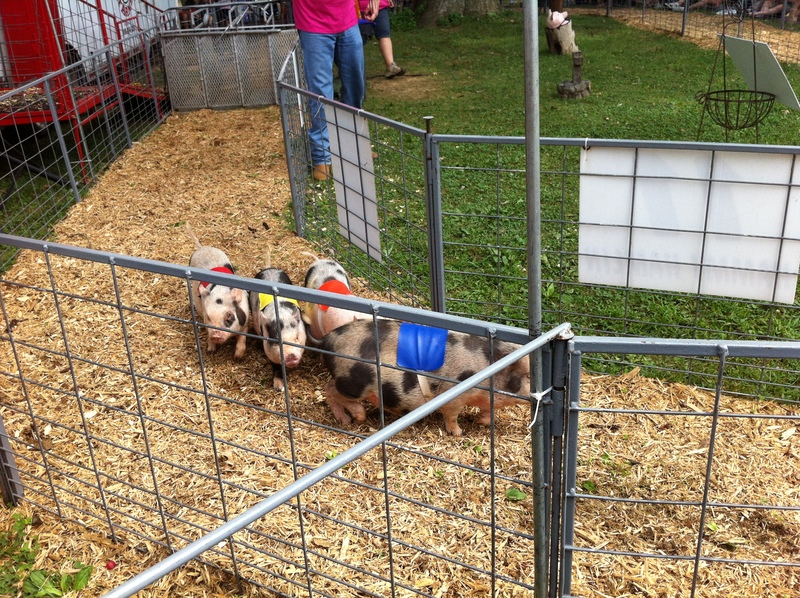 Jeremy was especially sad to miss the pig races! We got front-row seats! 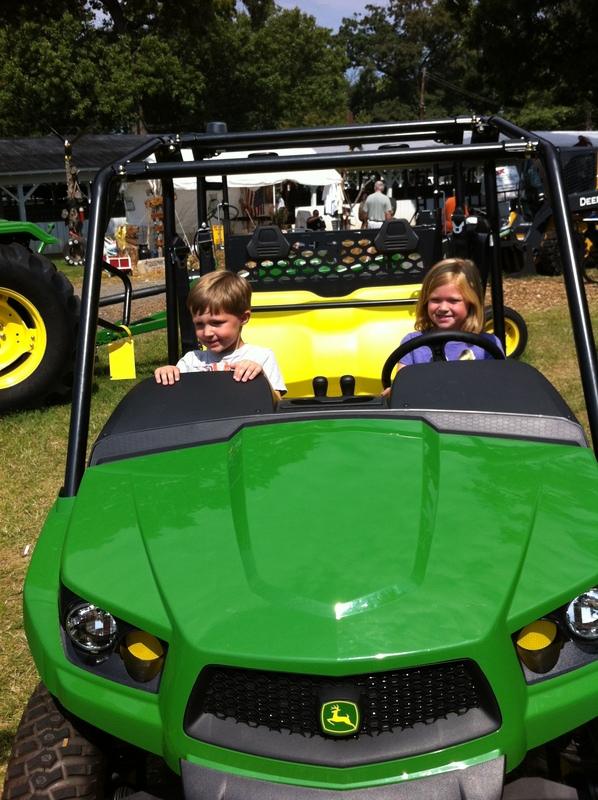 The kids got to check out all sorts of John Deere equipment. Hayes would have been in heaven! 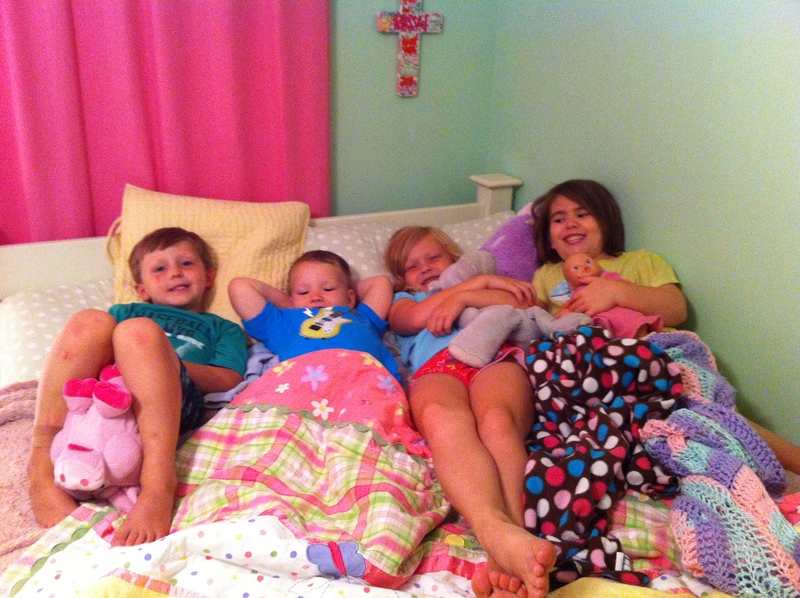 Any guesses on how long it took us to get these kids settled down and in bed? But it’s summer, right? That’s the end of our photo tour. What a week! I am so grateful that we got that last trip in before school started. I think it gave the kids and I some closure and will allow us to head into the fall with a new sense of confidence and adventure. We miss our friends and family down south, but when you have experiences and memories like the ones above, distance doesn’t matter. We will always have them in our lives, and us in theirs. There are two directions I could go with this title. The first would be to discuss the amount of uncontrollable “baby talk” Mason and Cooper have been doing this summer. Mason, especially, has this little baby voice that is so grating on my nerves. But that’s another post for another time. I remember reading somewhere that if you have any inkling of desire for another baby or any inkling of indecision about getting rid of baby stuff, you aren’t ready to let go of the idea. 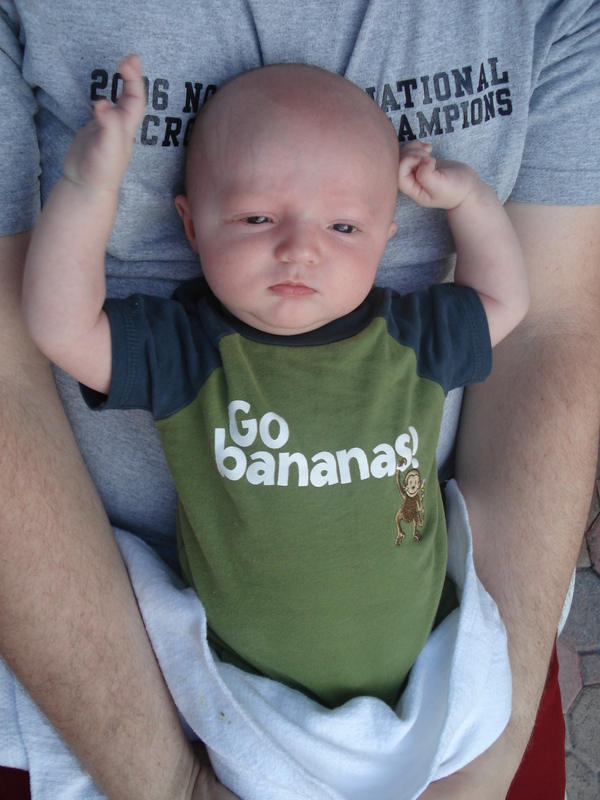 For me, I was more than ready to get rid of the baby stuff as soon as Cooper was done with it. Too big for the swing? Sell it. Done with bottles? Get rid of them. Growing out of clothes? Donate them. I never hesitated. Sure, I have kept the sentimental items, but as for useful things that another baby would need, it is all gone. And I don’t miss it. I can’t imagine having diapers in the house again. I can’t fathom 2am feedings. I’ve said countless times over the past year or two, “I can see the light.” Once you get out of diapers and the kids start becoming more independent, it seems like life opens up. Traveling becomes easier, family meals become calmer, bedtime routines get shorter… Of course we have other difficulties and other stresses as they get older, but new ages = new stages no matter what. And I’m just glad to be out of the baby stage. We love our life now. We love our family as it is. 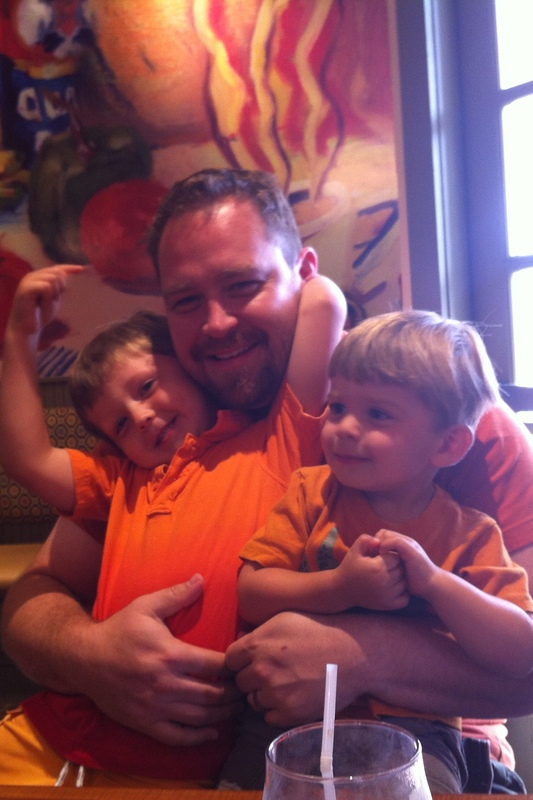 Mason and Cooper are our world, and I love bonding with them more and more each day. These are the kind of things I tell Mason when she asks for a baby sister. When she finally gives up for the day, we chat about the new babies coming into our world of friends and how much fun it will be to hold them and play with them…. and how great it will be to give them back when we’ve had our fill. 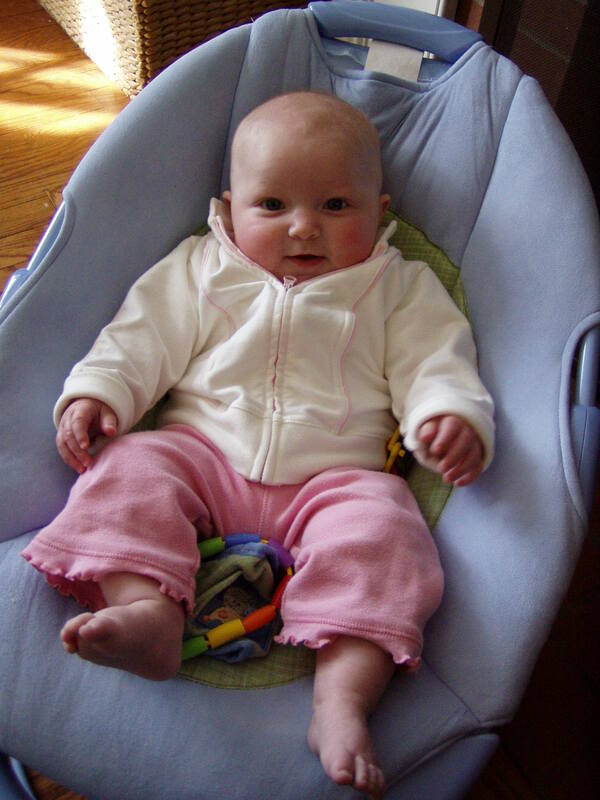 Just for kicks, here is little Miss Mason as a baby. Oh, those cheeks! And the Coop-Man. Always chillin… These days – not so much. 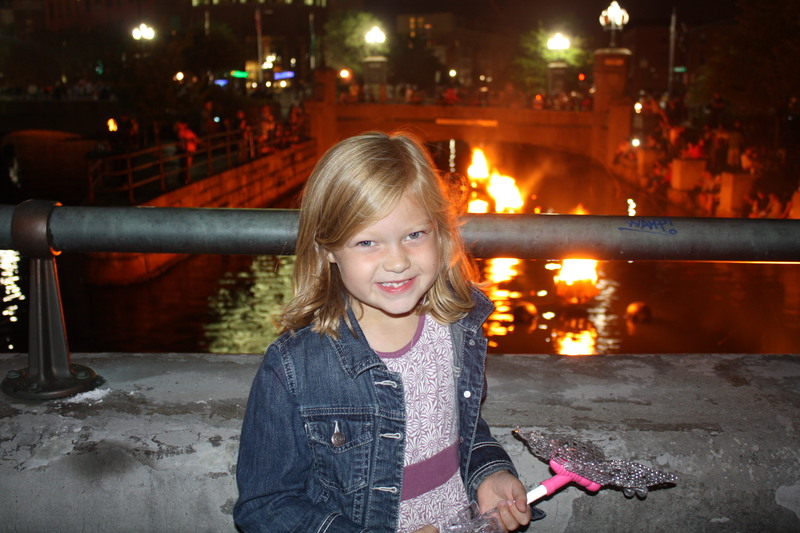 WaterFire is a tradition here in Providence. Throughout the summer (depending on sponsors), cauldrons are lit at sunset all along the river through the city. We had heard about a lot about it even before we moved here, but last night was our first experience. It was amazing! The energy in the city was exciting. The music was enchanting. The view was mesmerizing. Vendors are set up all along the river. There are musical acts and street performers. 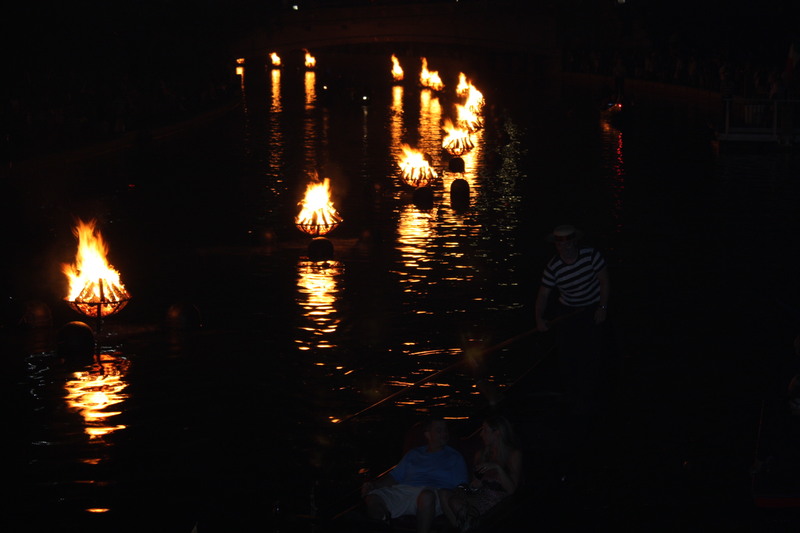 The coolest, though, are the gondolas gliding through the water right next to the lit fires. Not sure how much something like that would cost, but I’m hoping for a date night in a gondola next summer. A girl can dream, right? I certainly don’t have the knowledge or the camera equipment to take good night shots on our camera, so this is the best I could do. 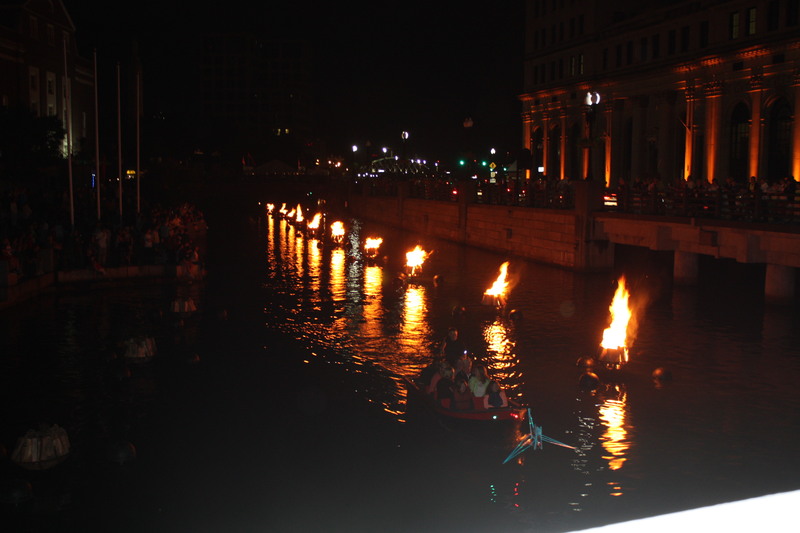 They certainly don’t do it justice, but hopefully just the glimpse of what we saw will encourage you to join us for WaterFire 2013! About 4 hours ago, I was sitting in traffic in my car having been in the car for over 7 hours. I wanted to cry. I wanted to get out and run. I wanted my kids to be QUIET!!! I thought to myself, “Worst. Day. Ever.” But we got home, we ate pizza, we watched So You Think You Can Dance and life turned around. It was a decent day overall. 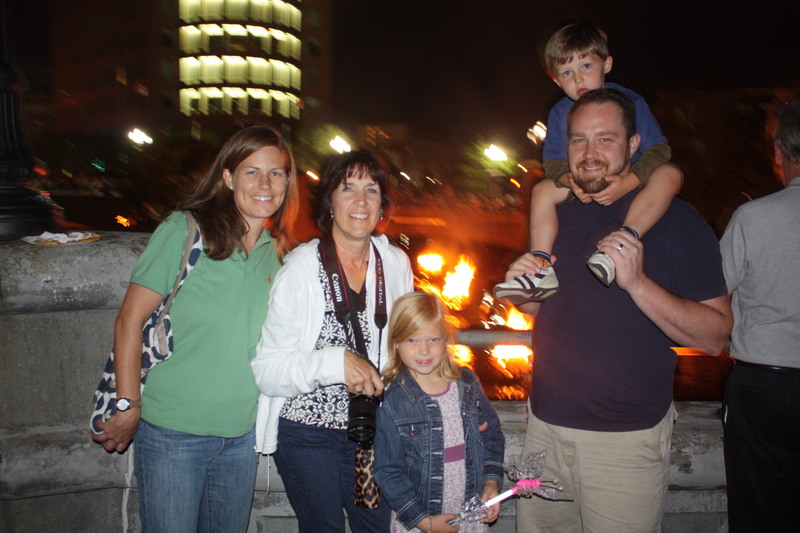 After finally getting the kids to bed, I sat down to look through pictures from our trip back to Maryland. There are a lot of great ones that I’ll get into soon, but the one that got me was this one of Cooper sleeping. No matter all the crap that can go on in a day, (especially today!) I was reminded of this sweet and pure moment in time this morning. He was fast asleep, peaceful, quiet and gosh darn adorable. 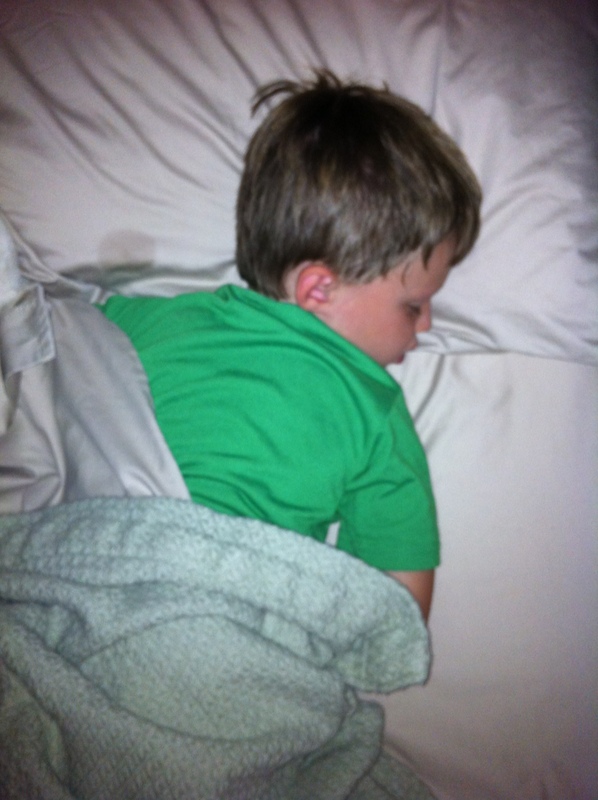 I remember thinking this morning, when I took the picture, that seeing him asleep was going to be my “good” today. No matter what came at me the rest of the hours, this one moment – so small compared to the rest of the day – was all I needed to make this day good. I’m so glad I took the time to scan through my pictures tonight or else I would have forgotten all about it. There truly is good in every day, and I need to remind myself of that even during the hardest days. 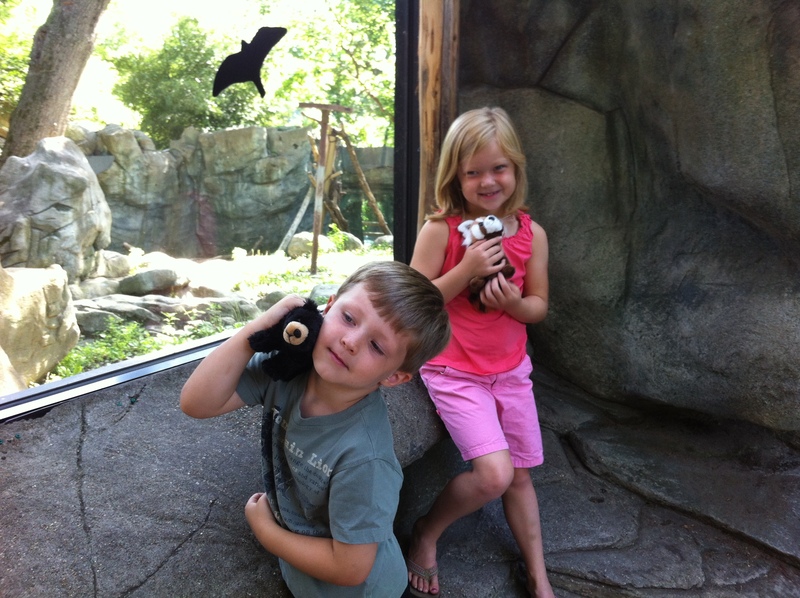 I feel like my kids have a problem… They are addicted to stuffed animals. Is it only my kids? 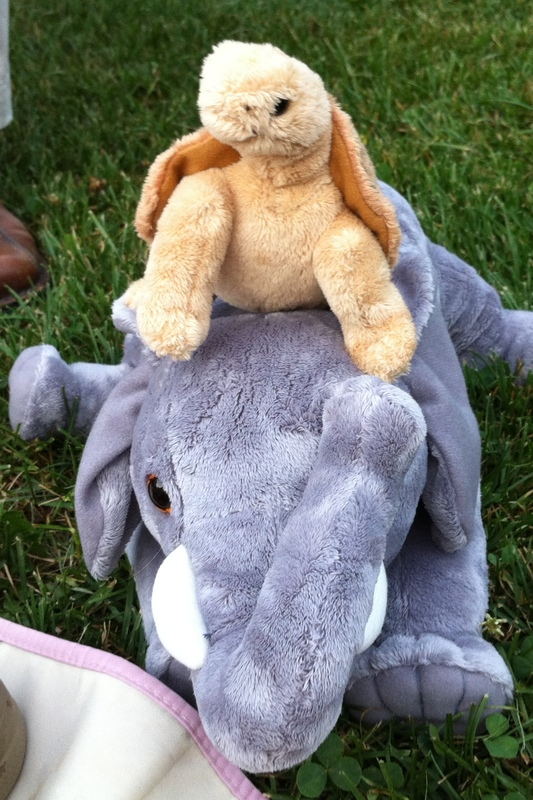 I feel like most of my friends’ kids aren’t as obsessed with stuffed animals as mine are. We have two huge bins of stuffed animals, and they still want more! I have no idea where it started. I don’t remember being this addicted as a kid. I remember my Cabbage Patch dolls and my Barbies, but not stuffed animals. Jeremy thinks he had a lot as a kid, but certainly not as many as are taking over our house now. I fear that they will revolt one day and push us out. They get together each night in their respective bins preparing for the takeover. Ok, so maybe that’s an irrational fear. Mason and Cooper treat their “friends” well. They put them in school, perform puppet shows for them, put them down for naps, change their clothes… It’s all very civilized, and their “friends” should be happy with their lot in life. They have just started giving them real names too. The oldest ones have simple names – Hippo, Monkey, Kitty… The latest additions have names like Sam, Molly, Laila. It’s a nice change, but we’re still learning. They need name tags now so we can keep them straight. They already have plans for their next purchase. Patience is not one of their strong points, so saving up the next $10.00 will be tough. But I have a feeling that stuffed animals are here to stay in our house. It’s not the worst thing. They are soft and cuddly and adorable. And they don’t hurt my feet if I step on them when they aren’t cleaned up. It could be a lot worse, I know. I have to learn to love the stuffed zoo that is my kids’ room. First up was Jeremy’s mom, Nana. Then my mom came. Her trip was overlapped a day by Jen, Scott and Hayes. 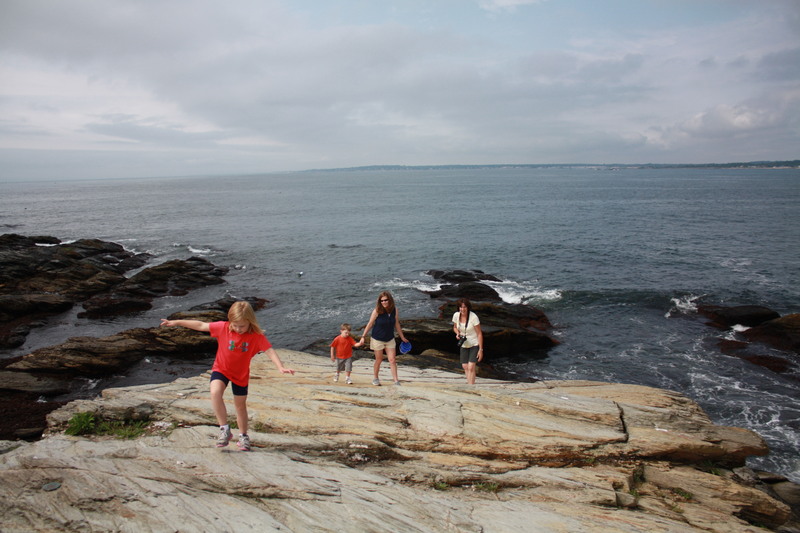 The kids and I loved having extra people join us on our adventures, and I especially loved having adults to talk to each day. Here are some of the highlights of the past couple of weeks. 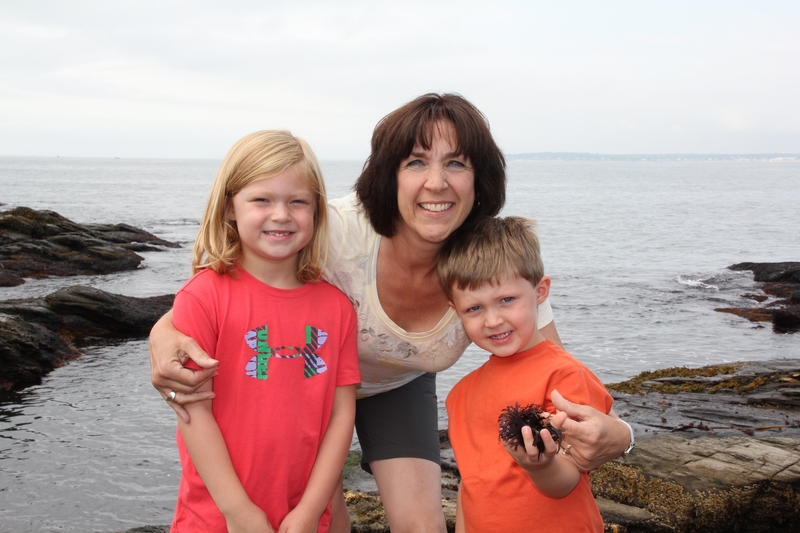 Checking out seaweed at Beavertail with Nana. 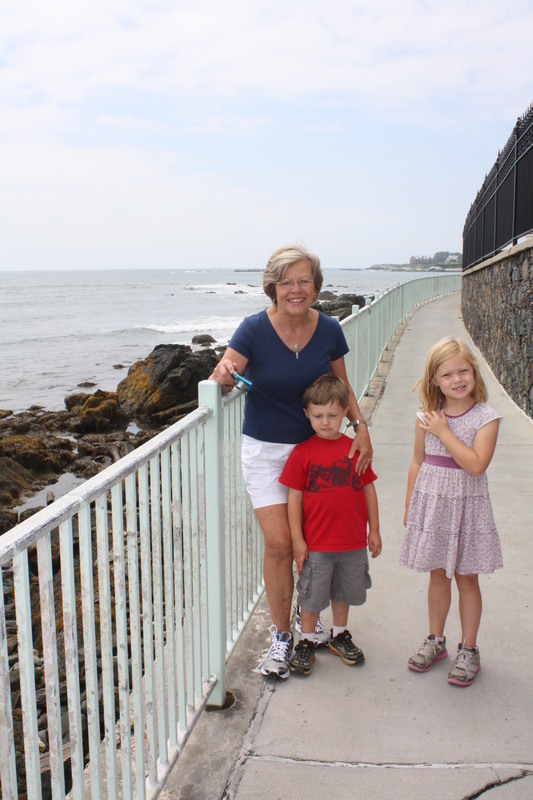 Strolling along Cliff Walk in Newport with Meema. At our new favorite beach/playground hangout. 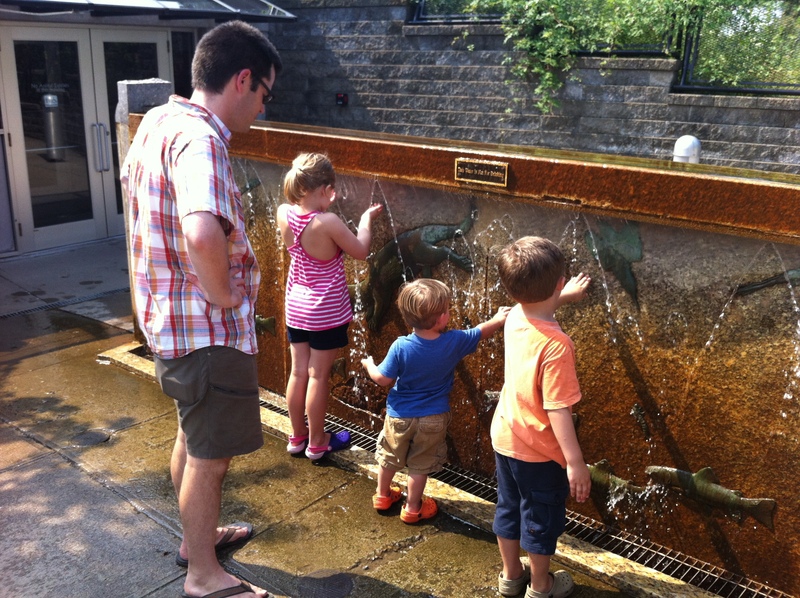 Staying cool at the Roger Williams Zoo with Hayes. 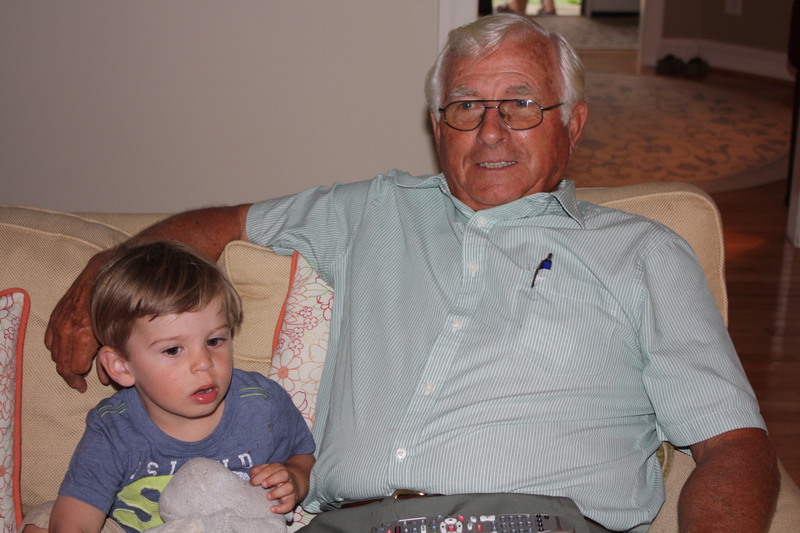 “Uncle Jewemy” relished in his special Hayes’ bonding on this trip. 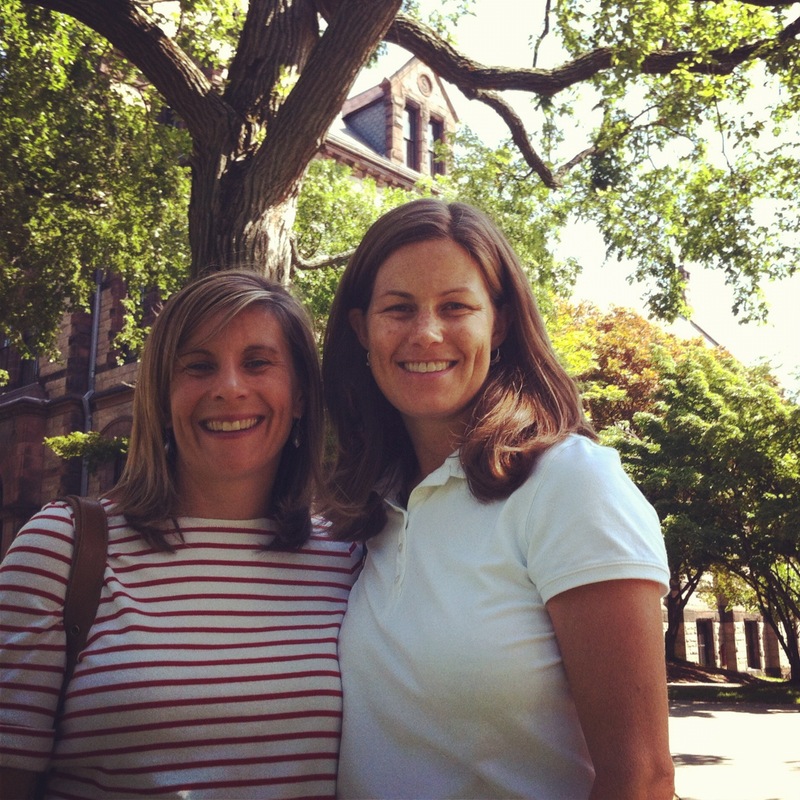 Enjoying the grounds of Brown University of my sister. 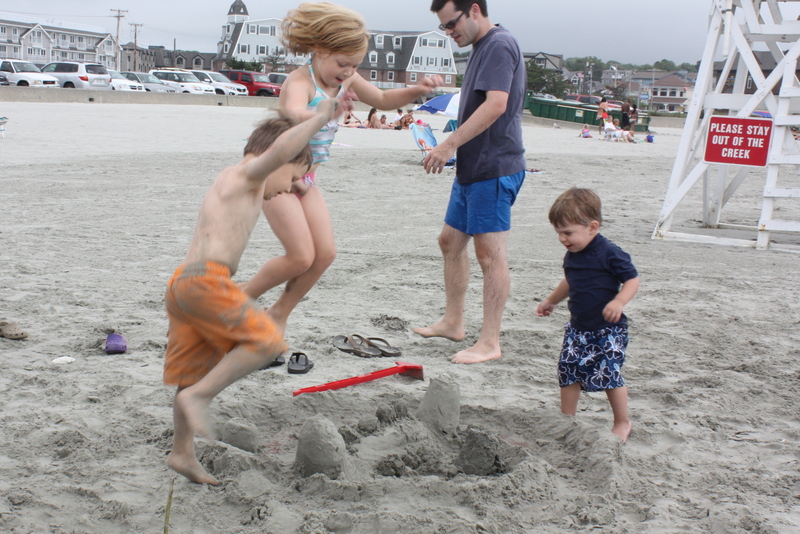 Stomping sand castles at Newport’s First Beach. Now you can understand why I haven’t been blogging. It’s been a busy couple of weeks! But we couldn’t have been happier to have the guests. We only have two more visits planned (first Nana and Papa and then Kristin), so we’re taking reservations for the fall.